I originally set the dates for the spring walks without checking the 6 nations fixtures. What a daft thing to overlook! I have also investigated the next section in a bit more detail and think it will take longer than originally planned, as the route I want to take is along the current coastline, rather than the Saxon Shore Way, which runs quite far inland on the Gravesend to Rochester stretch. I am therefore going to walk tomorrow (3rd Feb), as not too bothered about watching the Italy v. France game, then on 10th & 17th March. Details on Route Plan page. 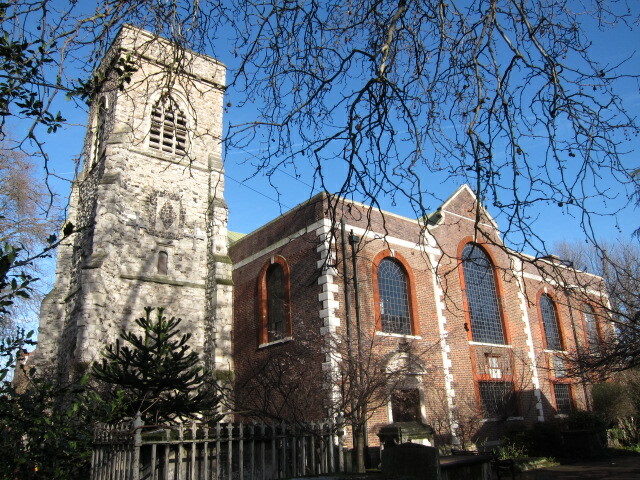 Here’s another picture from last week, of Deptford Church.